Namaste! 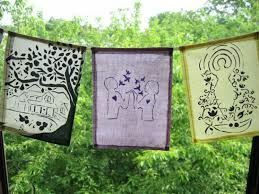 For centuries Prayer Flags have been hung to send beneficial prayers and good fortune into the atmosphere every time the wind blows them. Using centuries old ground rules we will design our own interpretations of Tibetan Prayer Flags. Each participant will be given a blank set of five flags to be decorated with prayers, positivity, good vibes, and the artists' energy. To decorate the flags we'll use vintage wood blocks from Norm's collection along with pens and paints. When they are completed they can be used to decorate home and garden areas! Join in this popular annual event as Norm provides you with ideas and some materials to create an amazing Fairy House to leave in the Womanspace Forest. Fun morning family time adventure! This is just in time for the Fairy Festival on July 21st where hundreds of children, adults (and fairies!) 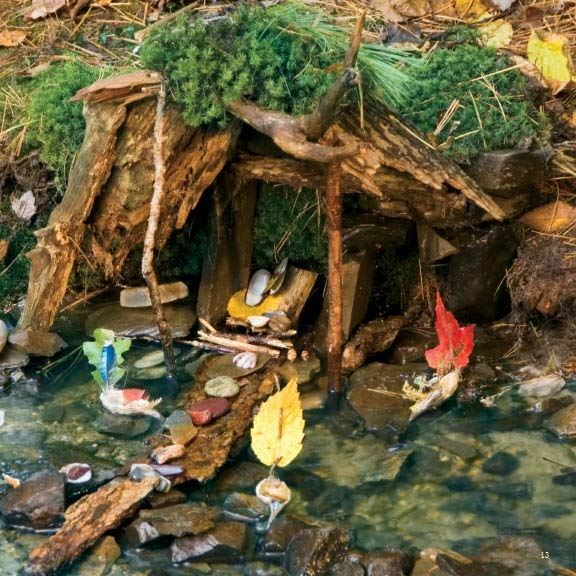 journey through the forest hunting for and admiring these creative and fun fairy homes. Come play in our gardens and woods and use natural materials you find or bring your own all-natural materials to create a comfortable dwelling for our forest fairies. Leaves, shells, stone, pet hair, nut shells, feather are moss are just a few ideas that make beautiful additions to any fairy home. Bring your camera, plus garden gloves, hiking shoes, long sleeves and pants for protection from the forest. Spend the day doing fun fairy things and sign up for the Fairy garden class. Bring lunch and have a picnic in the garden! 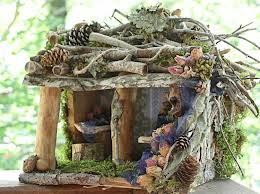 Create a special indoor fairy house of your very own! Norm will lead you on a special quest to create a special indoor fairy house. We will be using boxes, birdhouses and gourds to start, but please bring your own favorite container like wooden cigar boxes, small wooden crates, or CD cases. Clean out your craft area (or look through Mom's) and bring items to add to the Fairy exchange table for house and furniture assembly. Also, you can bring any artificial and real things from nature (feathers, moss,pebbles, etc) Anything goes, as long as your fairy will feel cozy in their new home!